I recently when on a self-guided tour of famous boulangeries and patissiers in Paris. Most of these were located in the heart of the city. Boulangerie Gana was the only place I needed to travel away from the inner circle for. And it is worth the trip. I’ve been to many boulangeries in Paris, but none struck me like Gana. It’s a powerful mixture of friendly service, busy bakers, and a stunning array of bread, pizzas, and pastry on display. The food is not decorated, spotlighted, gilded, or placed on a feather cushion. This is solid, traditional food that makes you salivate as soon as the smell hits your nose. Gana has been celebrated for their traditional bread making. You won’t find frozen dough delivered in the middle of the night at this bakery. This is French bread the way should be. I dare you to make it back to your home without biting a corner off of the bread. The crust is crisp and the interior is light and chewy. Gana is a boulangerie. It’s not a cafe or restaurant. It serves fantastic bread and desserts. They also have some amazing looking pizzas and tartines to snack on. However, you won’t find a huge assortment of vegetarian or vegan lunch items. I’m sure they have sandwiches available during the week, but I didn’t see any on my Saturday trip. 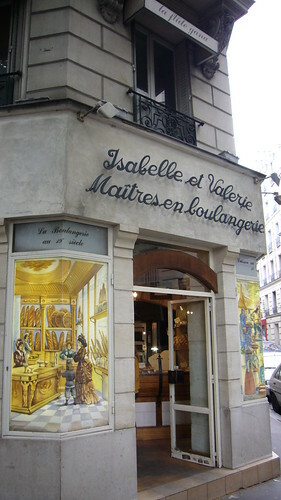 This restaurant is featured in Vivre bio à Paris .